Abram Q., a senior, is a very involved member of the student body at Martin High School and also a high-achieving student. 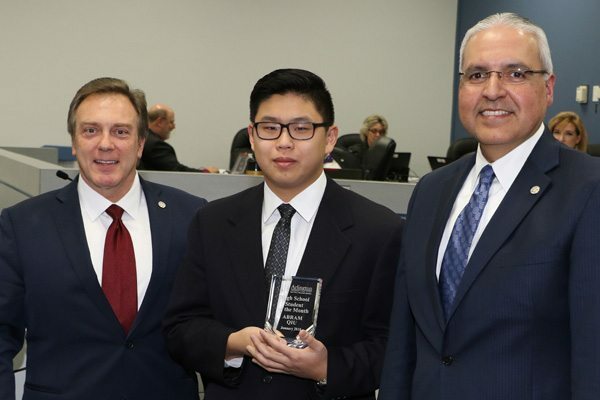 As a member of HOSA, Abram has assisted in organizing healthcare career fairs and educational outreach opportunities, and he was recognized in the Texas HOSA Bowl Team competition. He volunteers at the Open Arms Health Clinic and often shadows medical professionals. Abram plays the violin in the Martin Symphony Orchestra, performing at the TMEA competition last year and also traveling in December to Chicago to perform at the world-renowned Midwest Clinic. He has made All-Area and All-Region Orchestra. Abram attended NASA Texas High School Summer Aerospace Institute for Scholars and the CAST STEM Bridge Summer Program at UTA. He’s a national merit semifinalist and an AP Scholar with Distinction. He recently completed the City of Arlington’s Youth Leadership Program. Abram plans to pursue a career in the biological sciences or biomedical engineering. The personal sacrifices he has made to better his academic and enrichment studies should be commended. Congratulations, Abram!